The last post in this series about white. But of course I will be posting more white during summer! 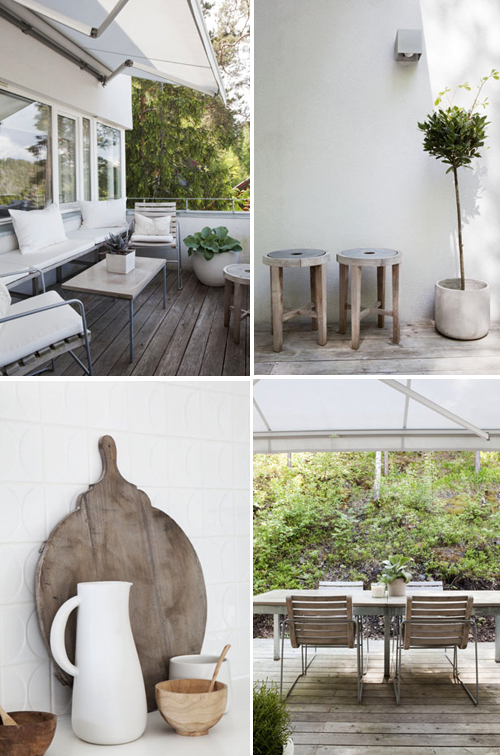 I love the combination of white and wood in these images (which are from the portfolio of Trine Thorsen). Ik hou van de combinatie van wit met hout en dan dat groen erbij. Een hele ontspannen omgeving! eigenlijk vind ik dit helemaal te gek.. I love white with wood, though normally a mid tone wood, rather than these lighter woods, but these are gorgeous – feels very coastal but without being too obvious. What is it about white and weathered wood?….I believe it to be Nature at its purest. It evokes a sense of serenity and softness. It beckons with a timeworn familiarity. Lovely! wow this is even more awesome than the previous white series!!! What a combination! I also love white with natural wood. Thanks for sharing attractive images.